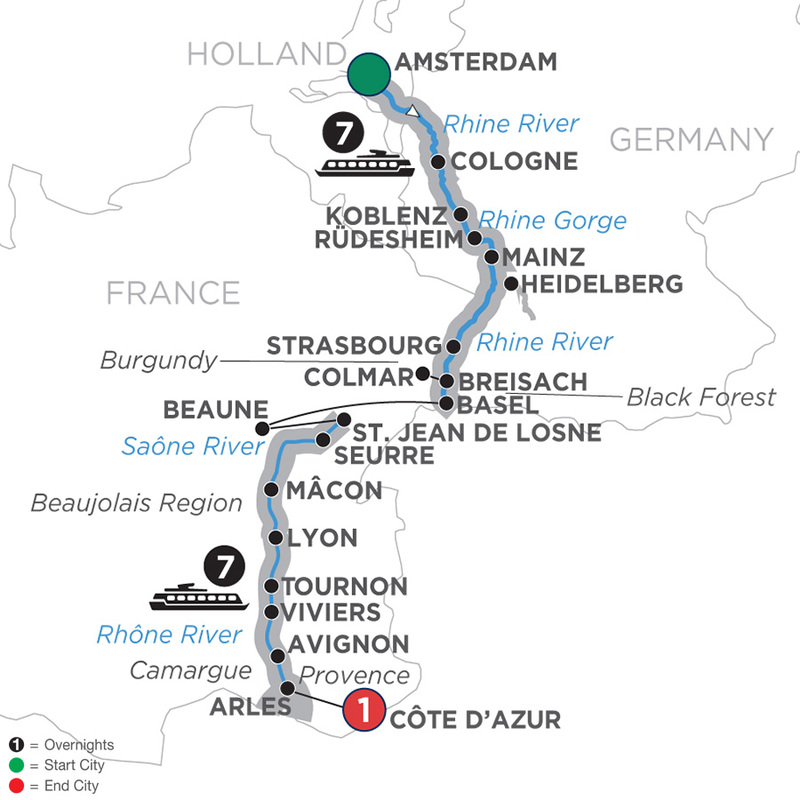 This mesmerizing journey sets off along the Rhine, then continues on the Saône and Rhône Rivers. Enjoy a canal cruise in splendid Amsterdam as well as guided sightseeing in Cologne, Koblenz, and Strasbourg. Delight in excursions to Germany’s Black Forest and to Heidelberg, Germany’s oldest university town with its imposing castle. Also sail through the dramatic Rhine Gorge, see the legendary Lorelei rock, and visit the Gutenberg Museum in Mainz. A motorcoach transfer takes you into France’s Burgundy region to fascinating Beaune for a Burgundy wine tasting or a visit of Hôtel-Dieu. Next, board your ship in quaint Chalon-sur-Saône and set sail for lovely Tournus, France’s gastronomic capital of Lyon, as well as medieval Tournon, charming Viviers, Avignon, and Arles. Before disembarking your ship in Arles, sail into the peaceful Camargue area (daylight permitting). Your vacation ends with an overnight on the French Riviera, also known as the Côte d’Azur. This cruise vacation has it all—castles, historic sites, delightful towns, and more!